There is one thing we do know about it, and it’s the thing that makes the Bamboo important to cocktail history: the Bamboo cocktail is the classic model for combining vermouth and sherry. That odd couple of ingredients is always at the heart of this cocktail, usually appearing in equal proportions in modern recipes, but there are no hard, fast rules about what style of vermouth, or what style of sherry. The low-alcohol mix often includes one or more types of bitters, and is often garnished with lemon, orange, or an olive. In other words, the Bamboo leaves the field wide open to the imagination; nearly every bartender, and every writer or compiler of bar manuals, has put his or her own stamp on this one. Bartenders have had well over a century to tinker with the Bamboo’s vague outlines. The earliest reference I’ve seen is from 1886, an item in the St. Paul Daily Globe. The story describes the Bamboo in very recognizable terms, as “three parts sherry and one part vermouth.” The style of sherry is unspecified, the style of vermouth is unspecified, and there is no mention of bitters, but, well, maybe that’s just the streamlined newspaper version. It’s hard to know what to think of Boothby’s Eppinger story. On one hand, Eppinger could have invented the Bamboo long before he left San Francisco for Japan; on the other hand, the Daily Globe article, published 22 years previous to Boothby’s book, attributes the Bamboo to “an Englishman,” not to German-born Eppinger. Many modern writers describe the Bamboo using terms like “crisp” and “bone dry,” but pre-Prohibition tastes would likely have run to sweeter, richer formulations of the drink. Bar manuals of the era call for “dry,” “French,” or “Italian” vermouths; some specify “dry sherry,” others just “sherry.” Some call for orange bitters, some for Angostura. The combination of sherry and vermouth suggests that the idea of the Bamboo was to combine the herbality and spice of vermouth with the complex, salty richness of sherry. The trick has always been to find the right vermouth and the right sherry to make that happen in a sensible way. For example, a 1904 edition of Thomas Stuart’s Stuart’s Fancy Drinks and How to Mix Them is a little more specific about the Bamboo than the old Daily Globe article. Stuart recommends two parts sherry to one part Italian vermouth, with a dash of orange bitters. Boothby’s 1908 version of the recipe (the one where he attributes the drink to Eppinger) introduced the concept of the equal-parts Bamboo that seems to have become the modern standard: a jigger of “French vermouth,” a jigger of sherry, two dashes of orange bitters, and two drops of Angostura bitters, a squeeze of lemon peel over the top, and an olive garnish. 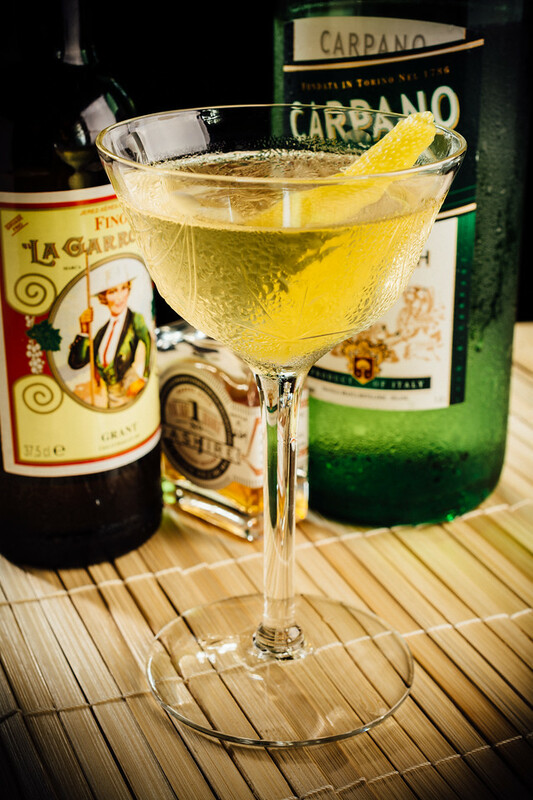 Still nothing to indicate the style of sherry; “French” was typically used to suggest dry vermouths. The Bamboo had evolved in fifteen or twenty years from a 3:1 sherry drink to an equal parts cocktail with bitters and citrus, and it is this Boothby model which seems to have set the pattern, however vague, for the future development of the drink. My favorite Bamboo is inspired by the original sherry-heavy styling, and lightly sweetened. I prefer a Bianco-style vermouth, which splits the difference between dry white and the sweeter Italian red style. Stir the all ingredients with ice until cold; strain into a chilled cocktail stem. Express lemon peel over the cocktail; (optionally) add the peel to the drink. Sherry isn’t everyone’s favorite drink, I get that. I’ve never been a big fan of the oxidized flavors of Oloroso or Amontillado, especially when trying to mix with other spirits. My preference is for Finos, which normally have very little oxidation, and tend to be relatively dry and light, and even a bit salty. Of course, if you’re a big fan of the more oxidized sherries, then the Bamboo is a fine cocktail to experiment with. And if you find just the right blend of sherry and vermouth to make it work, definitely add your preferred formula in the comments. The slight extra sweetness of the Bianco vermouth blends well with the Fino, which is no surprise, with sugar and salt being such a classic combination. I’ve used Carpano’s Bianco here, but Dolin’s Blanc also works well, and is probably more widely available. I prefer to add a couple dashes of orange bitters, and then express a lemon twist across the top of the Bamboo, to add a nice citrus nose. Some recipes, taking their lead from the Boothby model, add a dash of Angostura bitters; I think they are out of place in the Bamboo, though I can see how it might be worthwhile to experiment with them if you’re also using the heavier, oxidized sherries. And speaking of garnish: there’s that curious line in the Boothby formula, “serve with a pimola or an olive.” On one hand, I’m glad he wrote that, since I never knew there was special word, “pimola,” for red-pepper-stuffed olives. But really, what in the world was he thinking? This is absolutely no place for an olive. Fortunately, I’ve never seen any other bar manual that suggests that garnish for the Bamboo. It’s unusual to find an old classic that leaves so much to the imagination—so much room to play—as the Bamboo. You can spend years trying to find just the right combination of sherry, vermouth, and bitters, and I have no doubt that I’ll evolve the formula to yet another plateau beyond the one I’ve noted here. It’s a cocktail I’ve never ordered in a bar—who knows what I’d get? But it’s a great old classic for the home bar, where you can tinker and finesse at will. Start with your favorite sherry and your favorite vermouth, and you can’t go far wrong. “Searching for the Bamboo Cocktail” at cold-glass.com : All text and photos © 2017 Douglas M. Ford. All rights reserved. Eureka! I have struggled with the Bamboo for ages. None of the variants I have come across seemed quite satisfying – including that currently served at the successor hotel to the Grand in Yokohama. But the use of Bianco vermouth!! Sheer genius, Sir! Thank you, Philip, I’m glad that worked for you. A little bit of sweetness seems to be just the thing to tie the Bamboo’s flavors together. I’m realy happy with your Version on the Bamboo! Since years, I was awfully unhappy, I didn’t like that Drink, although it got a damn great Name. Sounds like warm, sunny Weather, Hollydays ‘n things like that. To take sweete white Wermouth is a perfect Option. I used “La Ina” Fino, Dolin Blanc and Feebrothers Orange Bitters, but no sugar. This made me think to play around a little, ’cause I always keep some different Sherrys behind the Bar! And finaly I opted for Lustau’s Dry Oloroso Sherry. Same Mixture like yours, this Time including some Dashes of Sugar Sirup. For another Try on Sherry, you should go on my Homepage, and give the “Tragito de Oro” a chance to lighten up your Life.